Inter Milan coach Roberto Mancini has confirmed that he will not stand in the way of Liverpool transfer target Martin Montoya should the defender seek to leave the club in January. The right-back—who is currently on loan at the San Siro from Barcelona—has wholly failed to make an impact since moving to Lombardy during the offseason. He was made to wait months for his first appearance for the Nerazzurri, and indeed, was only handed his first outings for the club in recent victories over Udinese and Cagliari. He impressed in the 3-0 triumph over the Sicilian side in the Italian Cup on Tuesday evening, but his days with Milan could be numbered, after Mancini admitted that he wouldn’t stand in the player’s way if he wanted to seek pastures new in January. “He can leave in January if he doesn’t find this situation suitable for himself,” the former Manchester City said on Tuesday, as per Goal. “Now he has played, proving he can be part of the team, but it’s up to him. “I have already spoken to him but in football things change in a matter of weeks. It’s up to him. He is a good lad, he’s serious, and polite. Should he tell me: ‘Look, I need to go to a team where I can play consistently’, what can I reply? 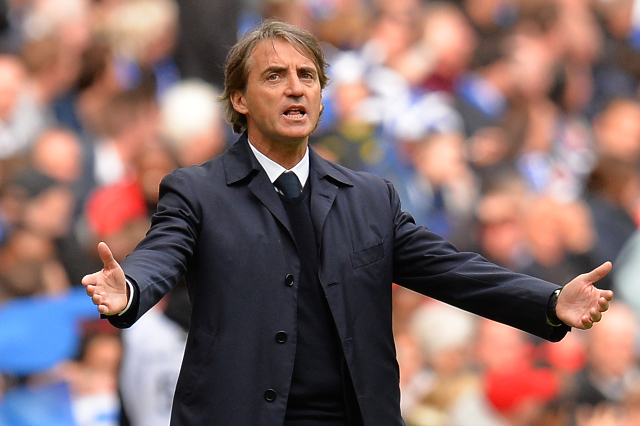 Mancini’s admission may come as good news for Jurgen Klopp, with Liverpool linked with the full-back in recent times. The Corriere dello Sport [as per the Daily Mirror] noted that the Merseyside heavyweights are long-term admirers of the Spaniard, and may be preparing to make a move for the unhappy defender at the beginning of 2016.